In a prospectively randomized study including 68 patients, the results of inside-out horizontal meniscus suturing were compared to meniscus repair using the meniscus arrow. 96% of the patients underwent re-arthroscopy after 3–4 months. Only lesions in the red/red or red/white areas were included. Patients were treated with a hinged brace for 9 weeks. 30 patients had an isolated bucket-handle lesion. 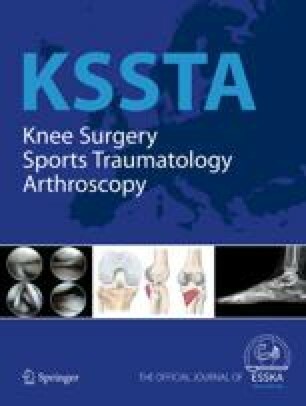 In 19 cases the repair was done in conjunction with an ACL reconstruction and in 19 cases the repair was performed in an ACL-insufficient knee. The two groups were comparable. Operating time in the arrow group was one half that of the suture group. Of 65 re-arthroscopies, 91% of the patients had healed or partially healed in the arrow group compared to 75% in the suture group (P = 0.11). In only 50% of the non-healed cases was this clinically suspected prior to control arthroscopy. The difference between healing in ACL-reconstructed and ACL-insufficient knees was not significant. Two patients in the suture group had a deep infection. There were no serious neurovascular injuries. Five patients in the suture group and two patients in the arrow group had symptoms in the saphenous nerve area. All patients had some synovial irritation at control arthroscopy but no severe reactions to suture or arrows were seen. Short-term results with meniscus arrows, based on healing and evaluated by second-look arthroscopy, seem promising.